The Internet is big. And we all hang out in our own corners of it. It’s not always easy to keep up with all of the update-and-release news that you need to keep your business systems running as smoothly as possible. We announce all of our software updates on a handful of public channels, and then after a few days of letting potential bugs shake out, we spread the word to the admins who have provided a valid email address. The majority of our customers are content to wait for that email announcement or the notification that appears on their control panel plugins, and that’s ok! But what about the rest of you? We know some of you crave adventure, and you want to install those updates the second the paint is dry. You have a need to be hooked into the latest announcements, but if you don’t know where to look for them (or, more importantly, don’t know how to fit them seamlessly into your workflow), you could miss something important! So let’s address that. First, I’ll tell you where you can go around the web to find our update announcements. Then, I’ll share a few nifty tips and tricks for getting our news to come to you in the places that are most convenient for the way you work. Knowing where to look is all well and good, but you can work more efficiently if you have the updates meet you where you are. There are three primary ways to accomplish this: Email, RSS feeds, and push notifications. Each of our announcement mechanisms may be configured to use at least one of these methods. Our groups are low-volume enough that you should be able to subscribe to “Every new message” without being overwhelmed. If a mobile device is an important part of your workflow, you may find push notifications more your speed. All of our Twitter accounts support push notifications. For those not on mobile devices, the Chrome and Firefox browsers allow browser notifications for any site that has enabled the functionality. Twitter is one such site. To enable browser notifications for Twitter, click on your own profile icon, select Settings from the drop down menu, click on Web Notifications from the settings sidebar and check the appropriate boxes for the notifications you want to see. Here are a few outside-the-box ideas that may fit nicely into your workflow. 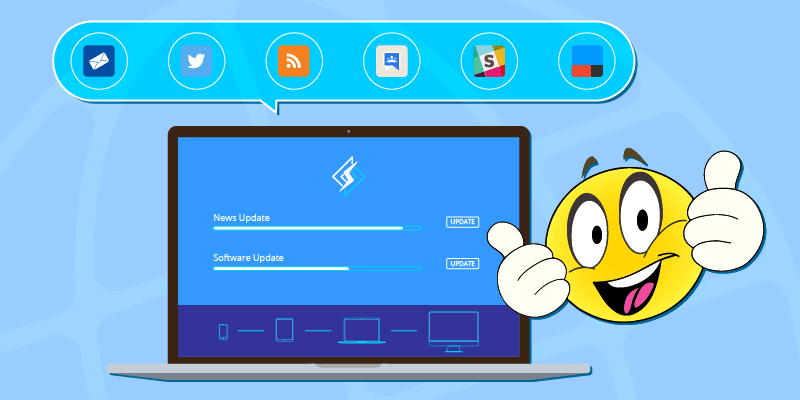 If your team uses Slack to communicate, why not set up a #software_updates channel, and import vital release announcements from your favorite vendors (including LiteSpeed, of course!) into that channel? Slack integrations are available for Twitter and RSS, so you can either import our Twitter feeds via the Twitter integration, or import our Google Groups or Forum feeds via the RSS integration. That’s somewhat of a silly example, but you get the point. A more practical application would be to connect our Google Groups or Forum RSS feeds or our Twitter feeds with an application your company uses extensively (Skype, Telegram, Trello and more). For example: if there’s a new LiteSpeed tweet, send the tweet via Skype to your server admin. Or, if you do like the traditional route of email or push notifications, you can use IFTTT to make the sources that are not available that way become available that way. For instance, you can use IFTTT to send Twitter updates through email. Or you can get an IFTTT push notification when there’s an update to the Google Group RSS feed. We want you to get your LiteSpeed updates in a timely fashion and through a medium that fits into the way you work. We hope some of these ideas can help you keep as informed as possible! Be sure to let us know if you have any ideas to add to this list! Which LiteSpeed Server Powers YOU?